San-Ten Consulting was happy to support the Master of Business Engineering Japan Program 2018 of the Steinbeis University, Steinbeis Center of Management and Technology. 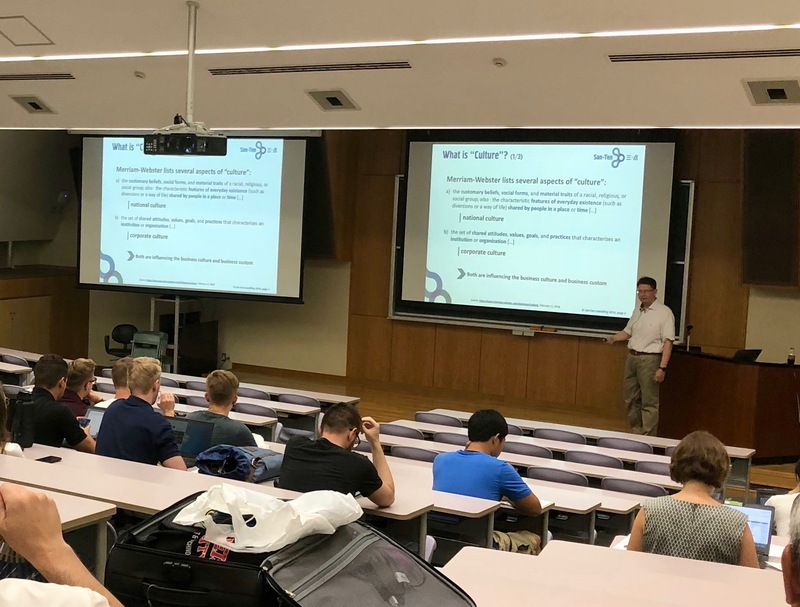 “Eating Peas with Chopsticks: Mastering Business in Japan” was the title of the lecture Dr. Ralf Mayer gave in front of about 60 students from Germany as well as from Tokyo University of Agriculture and Technology. Based on real business life experiences and examples, Dr. Mayer described the most critical cultural differences for doing business in Japan and how to master them in order to accomplish successful business. that have a tremendous effect on the business relation. Along real life situations, Dr. Mayer gave examples to better understand the culture of Japan (and of Germany) in order to enable the students to adjust their behavior in different cultural environments. “I don`t want to give the students just a list of dos and don`ts. I would like them to understand the background and be aware of the differences so they can react appropriately in any situation”, says Dr. Mayer. At the end of the lecture, the students understood the title of the presentation. Doing successful business in Japan means, you have to do it the Japanese way and accept to adjust your behavior to the cultural peculiarities. Like “Eating Peas with Chopsticks”, this is difficult and needs some training and experience. But eventually it is possible to do successful business in Japan. When asked about the most important factor for doing business in Japan, Dr. Mayer answered: “Clearly to accept the differences in time needed for decision making and building trust. There had been more than one foreign manager killing deals in Japan by putting time pressure on the business partner”. Since it can be difficult for foreign companies that have no experience with the Japanese market to cope with all the differences, San-Ten Consulting offers a broad range of support and management consulting in all kinds of business areas. For example our JUMP Assessment is a first step to get a clear picture of your possibilities and potential in Japan.